I weighed 5 times on Friday because I couldn’t get any consistency. The scale reflected 188.5 three of those times. It reflected 186.5 two of those times. I don’t really care what the exact weight is – I just care that my weight remained exactly the same or (potentially) decreased since I had another week of no exercise + illness + somewhat crap eating. I think we ate out 4 of 5 week nights, maybe? I slept a solid 8 hours on Friday night for the first time since getting sick and woke up yesterday morning feeling antsy to get stuff done vs. wanting to die … and spent today doing 6 hours of godforsaken yard work because of some freak burst of energy … so I’m definitely thinking I’m getting better. Unfortunately – Jon started feeling it last night. I’m ready for some normalcy and some wellness. The past month has kind of sucked. 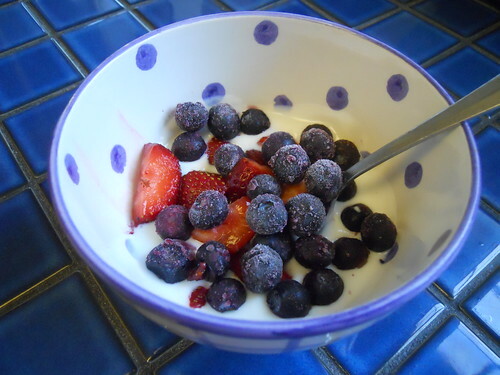 Jon made breakfast each day this weekend – standard fried eggs and yogurt/fruit both days. We stopped and ate a quick lunch on Saturday to prevent craziness since we didn’t plan our time well and were about to walk into the grocery store to do our weekly shopping while starving. 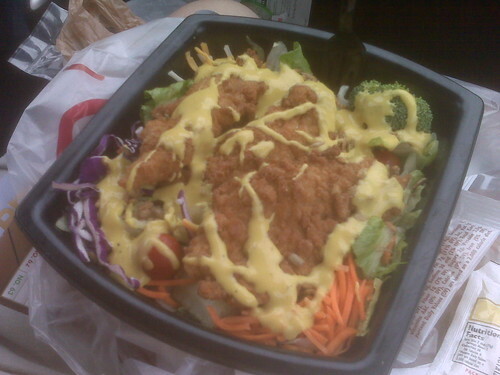 I am not sure what possessed me to get OR pour honey mustard dressing all over my salad, but damn. Ruined. I couldn’t handle the sweetness. I picked the 3 chicken strips out and ate those and threw the whole salad away … which is just a ridiculous waste, I know, but I couldn’t do it. Lesson learned. 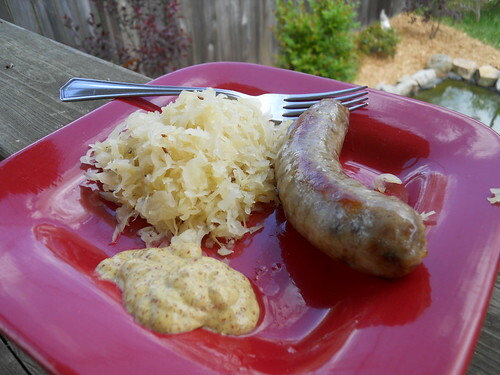 Lunch today was a brat and sauerkraut -outside because I was filthy and didn’t want to stop working. 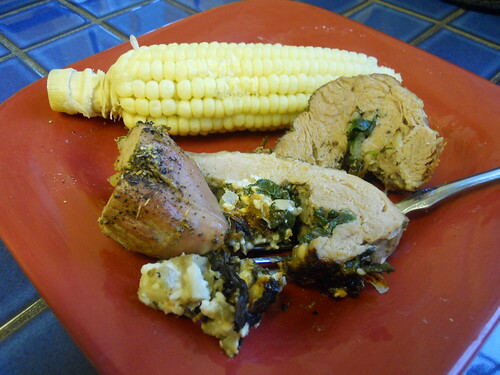 Jon cooked a fabulous dinner both nights – Saturday was something I think I’ve posted about before – pork loin stuffed with spinach, feta, mushrooms, onion and garlic. Plus corn on the cob. We had no string to hold the pork together so it’s less neatly rolly looking than before … but really? We didn’t care. 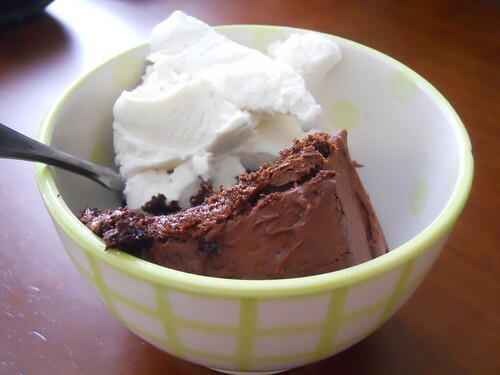 We also had birthday cake with ice cream in celebration of Jon’s daughter’s upcoming birthday. Jon made the cake from a box. He made the frosting, though, which was SO GOOD. I’m sure it’s just butter, sugar and chocolate (cocoa ? I have no idea), but THAT is some sweetness I can do. I really wish I had remained ignorant re: the fact that frosting can be made at home so easily. 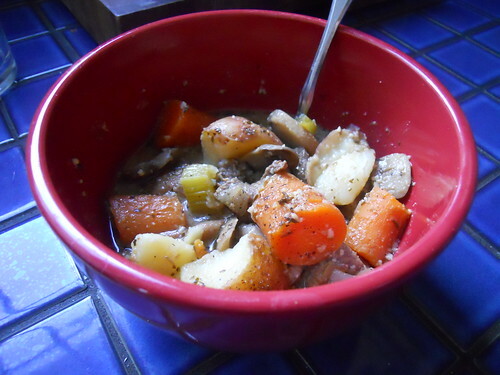 Today’s dinner was (made by Jon, of course) beef stew. 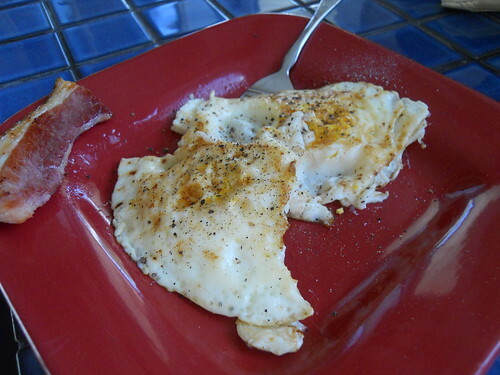 The little white dots are flecks of the almond flour he used on the beef. Whole thing = SO GOOD. I learned on Friday that Jon’s daughter’s school (maybe the county?) has something they call a “smart lunch.” We were on our way to watch a parade on Friday night and I was complaining about being hungry, so she offered some doritos. Jon expressed shock that she was carrying around doritos and asked where she got them – from her “smart lunch,” of course. I don’t know anything about it. All I know is her “smart lunch” consisted of a ham sandwich, doritos, teddy grahams, and an apple. And she had the choice to sub fries for the chips. I haven’t put much thought or research into the school lunch situation besides momentary outrage here and there based on news reports and Jamie Oliver’s show. Don’t know enough to have an opinion. Just thought it was interesting that a marketed “smart lunch” included chips and cookies and potentially french fries. Jon, of course, had a discussion with her about the chips and the cookies and about moderation and all that, but I think she’s alright. She had a bag of chips from lunch. Would I have still had a bag of chips from lunch? No way in hell. The gym is a definite priority for the next week. I am sore and tired from yard stuff today, but it’s really not the same at all. I’m definitely starting to feel the need for the fix I get from the gym now that I’m well – BADLY. I made Jon call and turn the directv back on yesterday. I don’t know what I was thinking turning it off – that was just a stupid idea.